Best Chinese Knives: Xinzuo Budget Layered 440C Chef Kitchen Knife Set Review! Xinzuo Budget Layered 440C Chef Kitchen Knife Set Review! I have received this kitchen knife set a while ago and would like to share my experiences with it. Some time after I got into the knife hobby and started paying more attention to knives in general I noticed that I wasn't satisfied with the knives I used the most - meaning my kitchen knives. So I've ordered a budget ceramic knife set (which I have till today and use those every day), but with time I wanted to get a real chef knife set to stay sharp and ready for those special cooking activity. 1. Description: 5 inch utility knife . Parameters : length: 235mm, blade length: 125mm, blade thickness: 1.8 mm, blade width: 22 mm, net weight: 82.6 g.
2. Description: 7 inch santoku knife . Parameters : length: 306mm, blade length: 178mm, blade thickness: 2.0 mm, blade width: 44.5 mm, net weight: 185 g.
3. Description: 8 inch chef knife . Parameters : length: 330mm, blade length: 202mm, blade thickness: 2.0 mm, blade width: 46 mm, net weight: 190.5 g.
Material : High quality three layers clad steel (440C core and 410 steel). Handle: exquisite Micarta handle, optical lens processing. Use for a long time not to distort, not faded, not shrinking, tasteless environmental protection . Hardness : 58±2 HRC (core). Surface Craft : forging and wire drawing (satin finish). I was impressed as I heard of Xinzuo before as a budget Chinese kitchen knife brand with decent quality, fit and finish, but never saw this kind of value from them (usually sell for a higher price). Anyway, the set seemed to fit my needs and I decided to jump the boat. The knives arrived pretty fast (less than 3 weeks) and were carefully packed in a black cardboard box (each knife separated by a bubble wrap, nylon and paper sleeve with plastic protector for the tip. No issues out of the box, no fit and finish or quality problems. 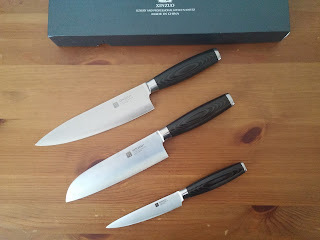 - The functionality: this is exactly the set I needed - 2 large blades (one Chef, one Santoku) and a smaller and thinner pairing knife, because those are the knives me and my girl usually use while cooking those special romantic meals, The knives perform as expected and are so much fun to cook with! - The quality: no issues at all out of the box and since. The micarta handles (although still not sure it is really micarta or polished G10, doesn't really matter) are fitted very well without any gaps, the grind is very thin and the satin finish is flawless and looks great. Overall really impressed. - The sharpness: the knives are very sharp out of the box and pass the "tomato test" with flying colors.They also keep the edge for a really long time (haven't sharpened them yet. - The ergos: the handles are comfortable (although will fit even better for larger sized hands) and pretty grippy, especially when wet, so they probably won't slip out of the hands while cooking. - The looks: the knives are genuinely impressive and look professional (much better than the pseudo damascus versions). - Lack of storage option: would love it if this set also included some sort of cool storage option, because to store them in a box those came in isn't the most comfortable way. - Asymmetric sharpness: if you inspect the knives closely, you might see some slight imperfections in the bevel (especially near the tip). - Overall I am very pleased with this set, as it is exactly what I wished for. 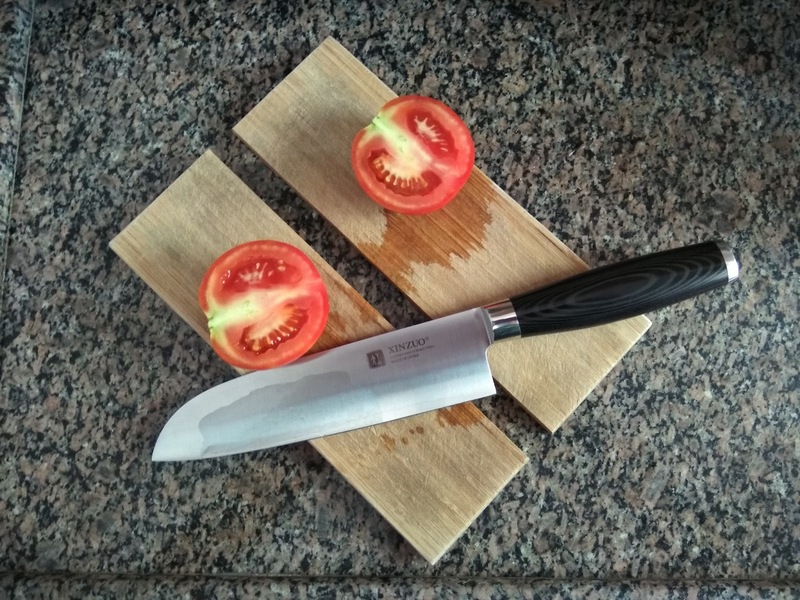 Must say that I'm not a professional cook (and definitely not a chef), so I've used the knives about 9 times till now and recommend those especially for a home (non-professional) use, although I believe those will perform excellent even in the hands of a skilled cook, who will use those every day, all day. So if you look for a budget kitchen knife set - this set might fit your needs perfectly. I have a knife set wuite similar to your's except that it has pinned handles and is labeled by the Eden webshop. I got the damascus version and I like it, more than the highcontrast black/white damascus versions. The biggest issue I have after 3 years of use is that the micarta was shrinking at the pins and where it meets the bolster. I also have a "damascus" version and can testify this laminated 440C is much better than whatever that "damascus" is made of. My knives are labeled as VG10 and the dust was same greyish rather than black as from a Shun knife with VG10 and as my Camillus folder. I got a 5" "utility knife 73 layers Japanese Damascus" and I like it quite a bit. Thanks for the heads up, I might buy more for Christmas presents.